The Villages hosted the 2018 Florida Association of Basketball Coaches All-Star Game this past Saturday. In a return to form, after two years of blow outs, the game was highly competitive and entertaining for the entire four quarters as Team Navy and Team White went at each other. Team Navy got the upper-hand early thanks to eight first quarter points from Berrick Jean-Louis from Fort Myers Canterbury. His efforts helped propel Team Navy to a 23-16 lead after one quarter of play. The pace of play slowed down a bit in the second quarter. The teams played evenly for the most part but the casual all-star game mentality crept in as there were a few too many unforced turnovers and unnecessary deep threes. After on half of play, Team Navy held the upper-hand with an eight point lead at 37-29. Clearly coaches for both teams, Darrin Wallace of Fort Myers Canterbury for Team Navy and Erhen Wallhoff of Fort Lauderdale Westminster Academy for Team White, got their respective teams re-focused to begin the third quarter. Team White came out hot and put up a 12-4 run in the first three and a half minutes to tie the game at 41. Thirty seconds later, Team White had their first lead at 44-43. From there the lead would change hands several times until the end of the third period which found Team White up by three at 54-51. Zack Scott of Westminster Academy and Serrel Smith of St. Petersburg each contributed seven points in the quarter while Miguel Ayesa of Hialeah Doral Academy drilled a pair of three pointers for Team White. The fourth quarter remained a close contest and the score was tied at 68 apiece with 3:30 to play. Team Navy extended their defense and converted some Team White turnovers into points. Team Navy finished over the quarter with a 13-7 run to win by a score of 83-77. Dante Treacy of Central Florida Christian Academy came up big in the final period with seven points and two assists. Berrick Jean-Louis (22 points, 4 rebounds, 4 assists): Recently de-committed from South Alabama, his play here certainly indicates that programs on the rise should look to invest in his stock. He’s very difficult to keep from the rim regardless of the pace of play. He’ll need to improve his perimeter shooting but his ability to collapse defenses as well as his defensive versatility will get him on the floor. Jahmel Myers (18 points, 9 rebounds): The only real interior presence for either team, the 6’7 Myers out of Cape Coral Mariner played smart in not attempting to try to become another perimeter player. He pursued rebounds, ran the floor, and challenged shots inside. Myers had a pair of dunks near the end of the contest to seal the game for Team Navy. Dante Treacy (15 points, 9 rebounds, 2 assists): The 6’0 Army commit was named the Class 2A Player of the Year by the FABC earlier in the day and his all-around play in the all-star game showed why. He was solid with the ball and was quick to track misses that strayed past the rebounders stationed near the rim. A few assists fell by the wayside when teammates failed to convert at the basket. Treacy quickly became a crowd favorite. Christian Miller-Caldwell (14 points, 10 rebounds, 2 assists): An unsigned senior as of now, the 6’5 Gainesville High product struggled with his outside shot but made up for it in different ways. He converted some easy baskets in transition and took the ball strong to the basket when given the opportunity. Five of his ten rebounds came in the first quarter when Team Navy built their initial lead. Caleb Catto (12 points, 6 rebounds, 3 assists): A Florida Gulf Coast signee, the 6’5 Catto from Southwest Florida Christian Academy was seemingly content to contribute in a variety of ways instead of just shooting threes. One of the top scorers in the state this past season at around 28 ppg, Catto was content to get the ball to Team Knight teammates Jean-Louis and Myers and let them do their thing. Catto hit a clutch late three in the final minutes of the game to preserve Team Navy’s lead. Kevon Godwin (2 points, 12 rebounds, 4 assists): Don’t be fooled by the small point total: The 6’1 Godwin led the entire game in rebounds! It took the FABC’s Class 1A Player of the Year a little over a half to find his rhythm with guys he’d never played with before but a bucket, four rebounds and two assists in the fourth quarter prove the Gulf Coast Community College commit is ready to contribute right away at the next level. Zack Scott (17 points, 9 rebounds, 6 assists): The FABC’s Class 4A Player of the Year has such a cerebral and smooth game that sometimes it seems like the game is very easy for him. He wasn’t far from a triple-double and might have gotten one if some more shots fell for his teammates. He’s headed to Florida Gulf Coast for his collegiate career and should combine with Catto for one of the better backcourts in the Atlantic Sun Conference the next four years. Serrell Smith (17 points, 6 rebounds, 3 assists): Awaiting his release from Ol’ Miss, the 6’3 Smith will be a hot commodity until he decides where to sign. A gifted jump shooter off the bounce, he’s also a crafty ball-handler and gets into the lane and to the foul line frequently. Remember, this is a guy that has dropped nearly 40 points on a group of high D-I recruits from Oak Hill the last two years. Don’t be surprised if he signs with one of the better teams in a big time conference. Miguel Ayesa (14 points, 2 rebounds, 2 assists): Unquestionably, Ayesa was the revelation of the day. As if leading Doral to a Class 7A state title wasn’t enough, he more than proved he is capable of playing with and against mid-major and higher D-I recruits. The jumper is picture perfect, has a quick release, and accurate from well-past the high-school three point line. Amazingly unsigned, no doubt programs that put a premium on shooting need to get in touch with Ayesa. He certainly could have helped Michigan State this past weekend. Keon Ellis (9 points, 9 rebounds): Headed to Gardner-Webb in the fall, the 6’5 Ellis was the biggest player on his team and sometimes got stuck playing on the inside. To his credit, he didn’t complain and played very hard. A lengthy wing, he is certainly more comfortable on the perimeter. Ellis was quite active on the offensive glass and he was able to disrupt opponent’s shots when defending outside of the lane. 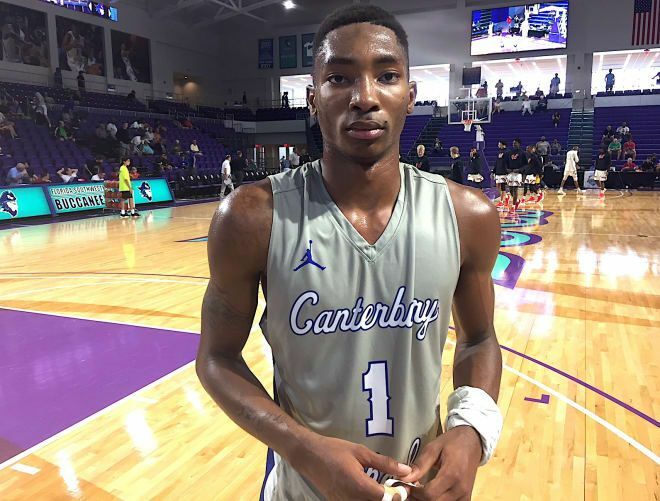 Rob Perry (8 points, 3 rebounds, 1 assist): A late addition to the event, the 6’4 guard from Orlando Oakridge didn’t match his 32 point outing in the state title game but still showed why he should get a few D-I offers sooner rather than later. Yes, his outside shot is not traditional but it work’s so why mess with success? Perry is also a better than average athlete, plays hard, “D”s up, and contributes on the glass. Cordrayius Graham (7 points, 3 rebounds, 3 assists): FABC’s Class 6A Player of the Year out of nearby Leesburg had a solid outing. He was a key player for Team White as they battled for the lead in the final quarter. Offensively, he’s better inside the arc but his three point shot continues to improve. He will have to choose between football and basketball at the collegiate level so his decision will be an interesting one. Darion Wilson (5 points): Wilson came into the game with a foot injury and while the 6’3 Wildwood product tried to make a go of it, he simply was unable to play in the second half. Still, he showed solid scoring skills and will certainly get a chance to play at the next level.